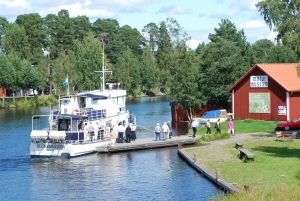 Guided boat tour to Torsång according to timetable in July and August. 45-minute-stay and the opportunity to visit the Motor Museum and Torsångs church. Minimum number of passengers: 15. Café on board. If you want food service, book in advance and we will reserve a table for you. To reserve tickets: +46 (0)23-650 20. You can also purchase tickets upon departure if tickets and seating are available. Adults: SEK 230 Children (age 2-12) SEK 110.